Parsley is one of the most common and most used of all the herbs. It was already in use in ancient Greece and Rome, though probably more for ceremonial purposes than cooking. It is believed that the Romans have introduced Parsley into Britain and Central Europe during their many years of colonial rule. Parsley then came to the Americas with the early settles in the 15th century. Parsley is a biennial herb – if the seed is sown in spring, the plants that grow from it will not seed until the following summer: they then die. Parsley likes good soil and a little shade. It also requires plenty of space. It is said that one plant should never touch another. Parsley seeds germinate slowly – it takes one to two months to get the first signs of a plant coming out of the soil. For cooking purposes parsley can be preserved by either deep freezing or drying. In my kitchen I like to freeze the leftover parsley in the freezer, because drying is difficult in a home kitchen. Today, we can find up to thirty varieties of this herb across the world. 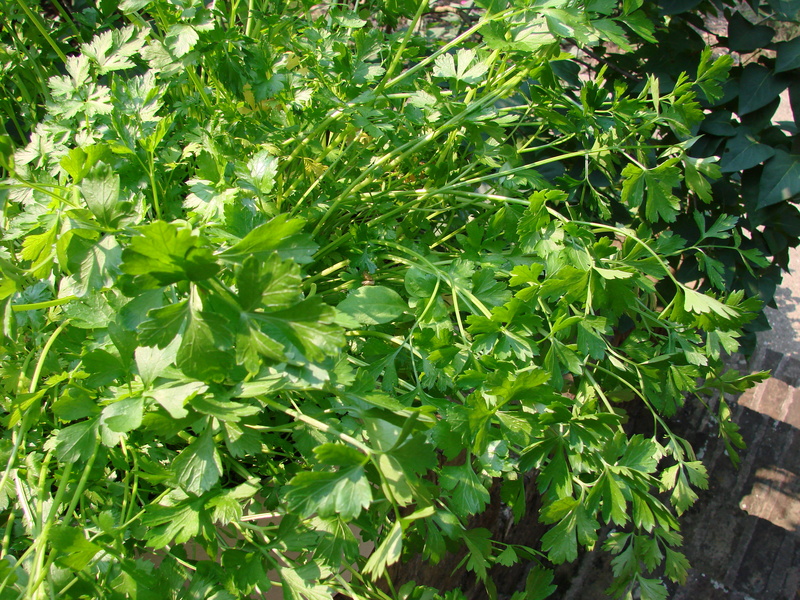 However there are two kinds of parsley, the flat leaved, (Petroselinium Neapolitanum) and the curly leaved, (Petroselinium Crispum) that are most used and most popular. The Italian parsley is grown in the Mediterranean countries for its stems, a local specialty of Southern Italy. The stems are eaten like we eat celery. There is actually another parsley the flat leaved Fool’s Parsley that can be often confused with the Italian flat leaved parsley. The Fool’s parsley is a common garden weed and sometimes roots in the parsley bed. Although the Fool’s parsley is darker and has a very unpleasant odor when stems are broken, the distinction is not very obvious. Many people have gotten quite ill from eating it by mistake, because it is poisonous. In European kitchens the flat leaved parsley is mostly used and here in the US we use mostly the curly leaved kind. Europeans feel that the flat leaved parsley has a stronger flavor, and they do not use it for garnishing, where in the US the curly leaved parsley is as much used for flavor as for decorating. Parsley is used in various ways in cooking: fresh, frozen or dried, as bouquet garni, persillade, chopped, whole, fried, decorative and always for its flavor. To include a bouquet garni in the recipe means that you are flavoring it with certain herbs and it is usually a savory dish. This bundle of herbs (like a posy) can be anything you want, however he classic combination is – parsley, thyme and bay leaf. These herbs are tied with a string or wrapped in cheesecloth to hold them together so that they do not float around in your broth while cooking. Sometimes these herbs can also be tied in a blanched leek. Parsillade – is to “parsley” your dish. Usually to “finish” it with chopped parsley after it is cooked. Parsley gives it the freshness that a cooked dish needs. Most people will describe Flavor and Aroma of fresh Parsley – as slightly peppery, and always delightfully fresh in taste. After a meal it cleanses ones pallet. The amount of parsley used in any dish is to the taste of the cook. There is only one dish that I came across that has to have a certain proportion of parsley to the proportions of the other ingredients, and this is a Lebanese Salad, the Tabbouleh. A very heart healthy salad that I prepared for your lunch today! This salad can be increased or decreased as wished, as long one keeps the proportions of each ingredient in proper order. The ingredients can be prepared the day before and stored in either zip-lock bags or plastic containers in the refrigerator. Then mix all ingredients together just before serving. This recipe is intended for a buffet and would serve about 15. Congratulations on your beautiful blog!! You have inspired me to get going and create one for my school. It’s way overdue. I will try your brad dough-looks wonderful and I know that my family will love it! I am just back from my cookinf program in Lucca with Chef Valter Roman. I wish you could come with me sometime. He is a wonderful, young, trained chef from northern Italy-pastry is his specialty. We stay in the most beautiful vills when i TAKE MY GROUP TO HIS PROGRAM. i RETURNED HOME ON aPR. 24TH AND ON aPRIL 28TH MY SON jOE AND HIS WIFe, Sara had their third daughter and our 4th granddaughter. Her name is Eleanor (Nora) Frances Kirmser. So now we have four little princesses to love. It’s very exciting. Stay well and Happy Cooking. Sally……..thank you for your nice note and I do hope you will start writing your blog soon. You have so much to tell – about your experiences in your cooking classes and then things that happen on your trips to Italy. I am sure some are lessons for life and others must be quite funny! I would love to read your blog and will be the first one to subscribe to it.